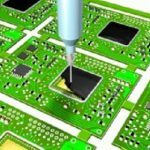 Electronic components are complex and powerful and used in a large number of products across many industries. The manufacturing of the components must provide maximum precision and reliability. This requires a lot from the production process to protect the components and secure the right conditions when it comes to risky challenges as moist, high temperatures, vibrations and dust. We supply dosing systems, which offer the ideal properties to ensure that all relevant applications in the electronics industry are perfectly dosed. And for metering, mixing and dispensing of two-part materials, Scanmaster offers a wide range of machines for varying applications. Call us or send an e-mail and discuss your opportunities with Henning. For all liquids and paste-like medias. We would like to advise you in finding the optimal solution for your needs.